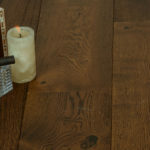 Villa Gialla Hardwood floors offers The widest and longest of our European oak lines, with planks that are 9.5” wide, primarily 7’3” long, and have an exceptionally thick 4 mm wear layer. The Villa Gialla finish is Urethane with Aluminum Oxide and can be installed Nail, Staple,or Floating.Most choices are finished with a very low-sheen urethane — in contrast to the glossier oil look. The powerful yet subdued colors are wire-brushed and hand-scraped to complete the look, making this the ultimate flooring for a modern and elegant space.